Preheat oven to 375°F. Trim the stems away from the beans before placing them into a medium-sized pot and covering them with cold water. Place the pot on high heat, and as soon as it comes to a boil, cook for 30 seconds more. Remove from heat, strain and transfer the beans immediately into a bowl of ice water. Allow to chill, then strain and slice the beans on an angle into 1-inch pieces. 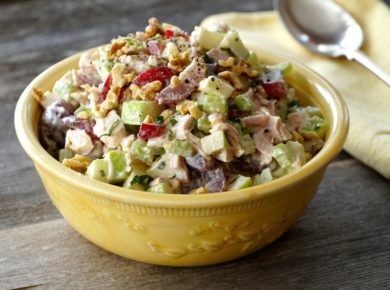 Place into a large bowl along with the sliced olives. Place the milk, butter and mustard into a large measuring cup. Add the Worcestershire sauce, optional. Add the soup mix and stir until well combined. Pour the liquid over the beans and olives and stir until evenly coated. 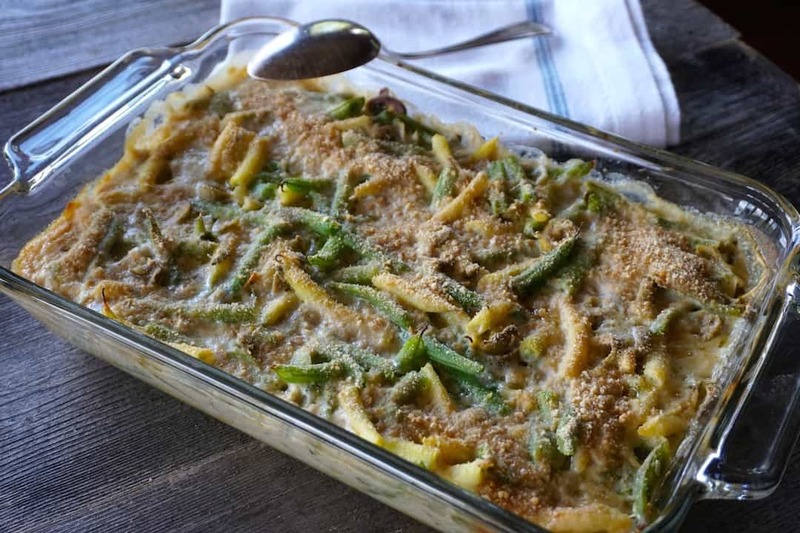 Transfer to an 8 x 11-inch casserole dish, spreading out into an even layer. 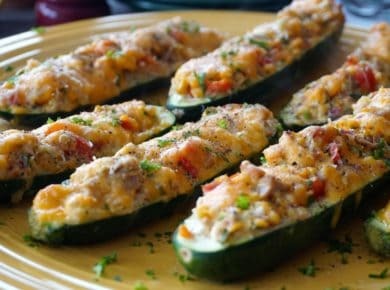 Sprinkle the bread crumbs over top and transfer into the oven to bake for 40 minutes or until the casserole is bubbling and the top is golden. Serve immediately. 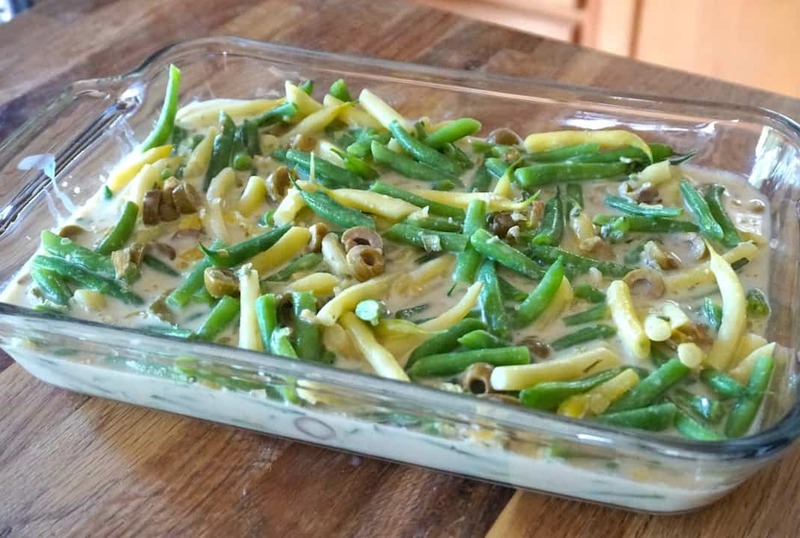 This is the absolute best VEGETARIAN BEAN CASSEROLE RECIPE in the history of bean casseroles – now that’s saying something! 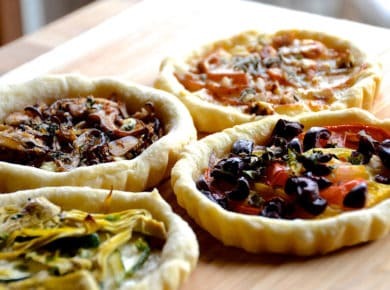 It’s probably no surprise at this stage when I admit how much I love talking about food. My family and close friends have come to expect it, and they’ll all say that the only time I’m not talking about food is when I’m eating it! 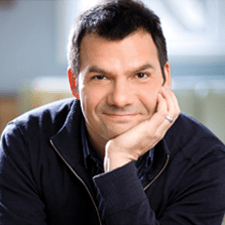 Such was the case a few weeks back – I was hanging out with my friend Kris when the conversation turned to Thanksgiving. 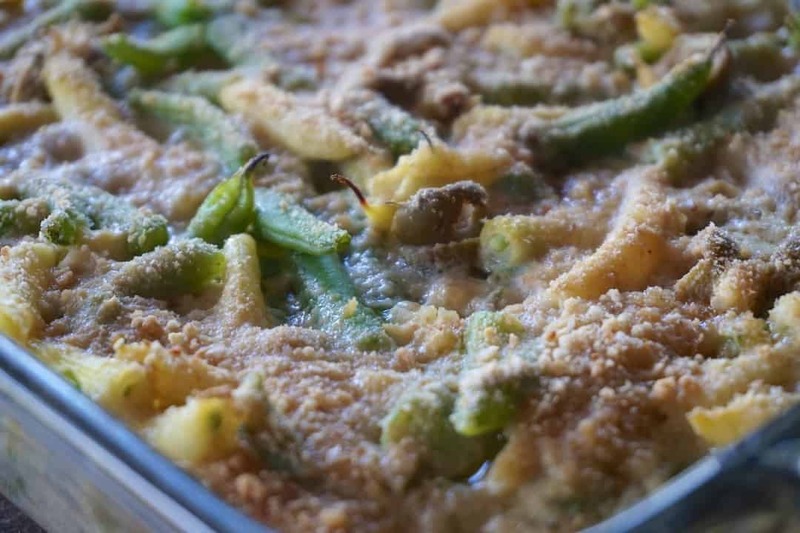 She casually mentioned an amazing recipe for a bean casserole made with leek soup mix and… wait for it… olives. 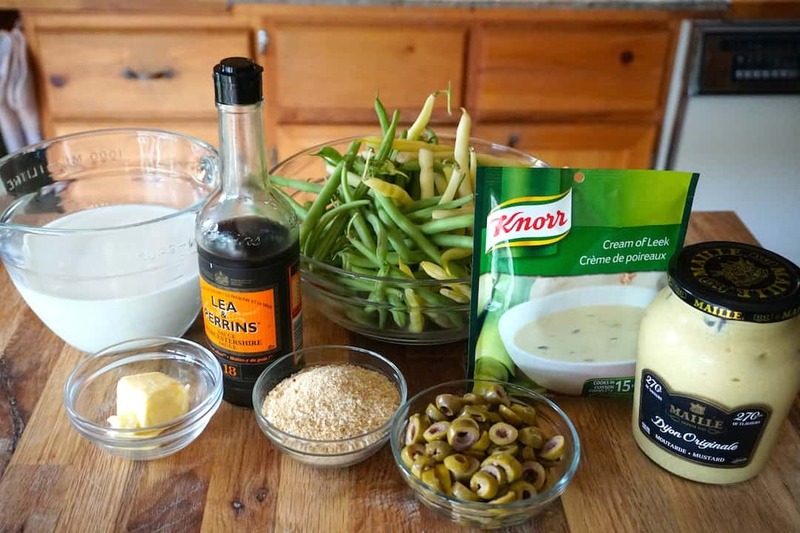 It was a double whammy – leek soup and olives together with beans? I’m in! 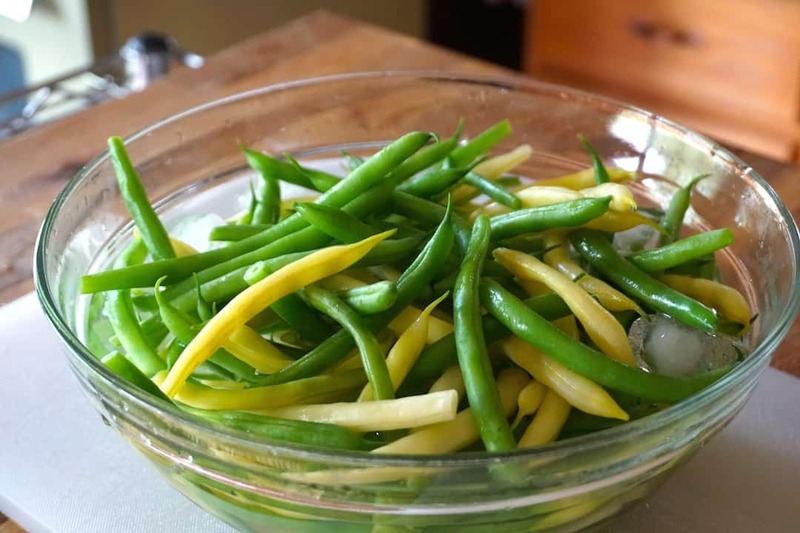 We tested the recipe a couple of times and found that blanching fresh beans works best. 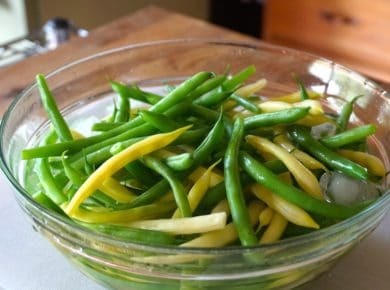 Never one to miss an opportunity to amp up the presentation of a dish, I used both yellow and green beans and love the look of the combo. Look for beans at a local market or farm stand – the goal is for you to enjoy the flavour of freshly picked beans – there’s nothing like it! Although we often see bean casseroles calling for a canned mushroom soup, I think Kris’ use of a dried leek soup mix is truly inspired and provides for a more pleasing flavour. We used the KNORR variety and I’ve included a link to purchase it through our Amazon store below. Here’s the scratch-your-head moment in the recipe where you think “of course!” Adding sliced green olives to something that gets all baked and bubbly is a brilliant idea. 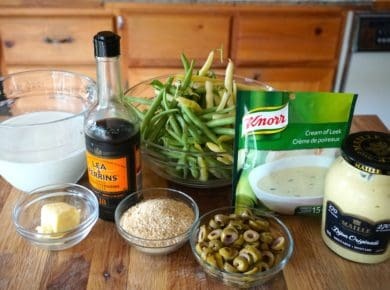 The olives work perfectly with the flavour of both the beans and leek soup and lend the dish some serious flavour. 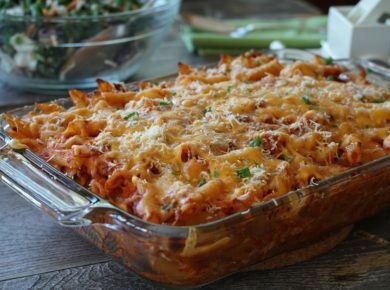 You’re going to appreciate how easy this recipe is to make, but I also want to share something Kris said to me with a huge smile on her face, “I swear it’s so good, I could eat the entire dish by myself for dinner.” Sold! 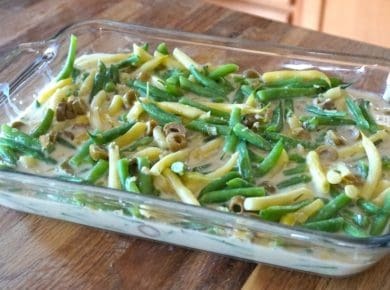 Of course, you’ll have many occasions where you can serve the VEGETARIAN BEAN CASSEROLE RECIPE. 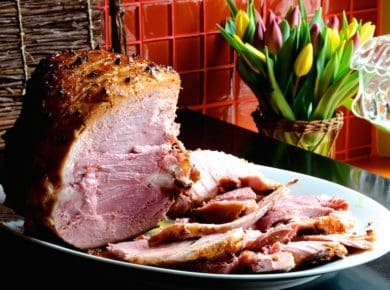 It’s so good though, I’m suggesting it as a perfect side next to our always-remarkable SALT-BRINED TURKEY, BAKED HAM and our easy to enjoy ROASTED PORK SHOULDER. 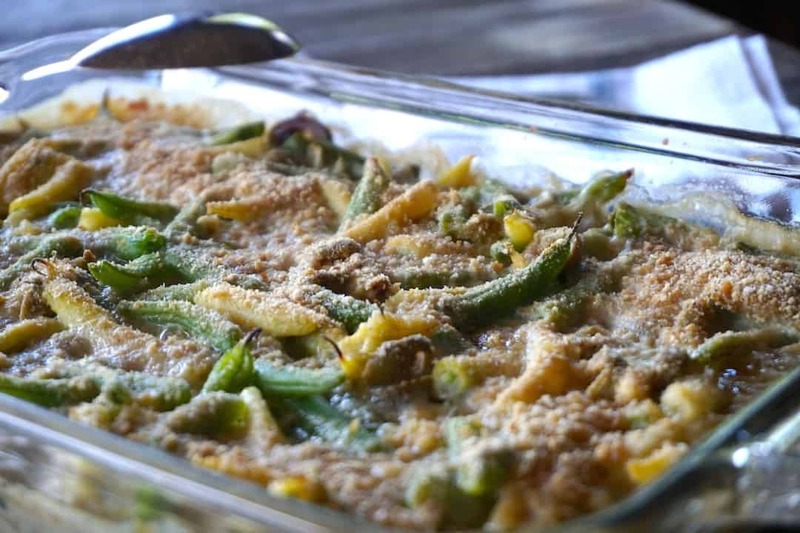 This new take on the VEGETARIAN BEAN CASSEROLE RECIPE sets the bar pretty high.